A supercell thunderstorm moved over the Maitland/Newcastle region this afternoon bringing with it heavy rain and large hail. Hail larger then golf balls (5cm) has been reported from some suburbs of Newcastle, while heavy rain and hail hit the eastern parts of Maitland. Flash flooding and minor hail damage has also been reported. The thunderstorm developed mid afternoon and moved away from Paterson in a northwest-southeast line hitting the eastern parts of Maitland and Newcastle after 3pm. 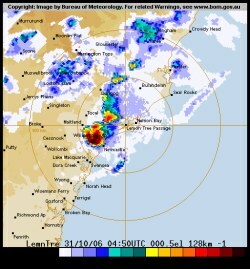 The storm intensified after it split from another cell near Paterson that eventually moved east before it dissipated. In approximately 30 minutes, 35.8 mm of rain mixed with hail fell at Berry Park (4km east of Morpeth).